The program described here is available on this month's ST-LOG disk, in the databases of the ST-LOG ST users' group on DELPHI, and on BBSs and other online services throughout the country. Because this program is "shareware," anyone who enjoys it should send the requested donation to the author. When I bought my Atari 520ST, I also purchased two pieces of software to get me started: a Pascal package and a graphics program. I bought the former because I needed to write some programs to replace those I had used with my old computer. I bought the latter because I was knocked out by the graphics capabilities of the ST. Two and a half years later, I am still intrigued with the ST's superior graphics power. 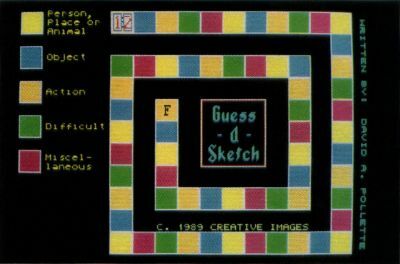 These graphics capabilities apparently also impressed David A. Pollette to the extent that he sat down and created this month's featured shareware program, Guess-A-Sketch, which combines the elements of a graphics program and a word game. Guess-A-Sketch is designed to be played by two teams of two players each. The object of the game is to draw a picture representing a given word in such a way as to get a teammate to guess the word within the allotted 60 seconds. This is a difficult task, one that requires imagination and a quick drawing hand. The opening screen requires each player to input his/her initials so that the computer can address each participant individually. A choice of word files is then presented. The game includes one word file; others may be created by the Guess-A-Sketch word file editor, which is available to those who send in their $10 registration fee. Three different-sized game boards are available, one with 39 spaces for first-time players, one with 63 spaces for average players and one with 71 spaces for dedicated players. The first time the game is played, it may be a good idea to use the practice mode, which allows game play without scoring. This mode is especially helpful if more than one player is new to the game. The program then rolls the dice to determine which team will begin. 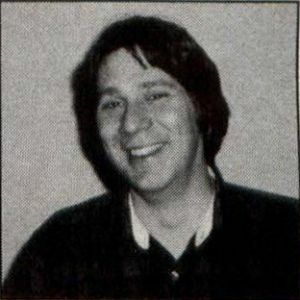 One player from this team is identified as the artist and his teammate as the guesser. The person designated to guess then turns his/her head while the other clicks the mouse button. A word from each of the five topics is then displayed, one of which is chosen by the computer as the target word. The topics are labeled "person, place or animal," "object," "action," "difficult" and "miscellaneous." After ringing the bell and flashing the word eight times, the screen changes to a drawing board. At this time the guesser can face the screen and watch his teammate attempt to draw a picture suggestive of the word. The individual drawing the picture has several tools to aid him. Besides having a pen with which to draw, the brush size can be changed, a straight line option is available, and the color of the pen may be altered. A fill option is also offered to speed the drawing process. The lower left corner contains the outlined drawings of an ear, a pair of scissors and a plus sign. Clicking the right mouse button while pointing to one of these three areas brings up a large icon that indicates respectively, "sounds like," "cut" and "add." This is the level of play where imagination becomes important. A representation of the word can be drawn, portions of the word can be drawn, or its meaning can be altered and modified, as in the game Charade. The upper-right corner of the screen contains the player's nemesis, the timekeeper. Starting at 60, it counts down, second by second, to zero. If the word is guessed before the minute has been counted, a key must be pressed to indicate success. If the word is correctly identified, the computer rolls the dice to indicate how many spaces the team's token will be advanced. The successful team retains control of the mouse with the team members swapping draw/guess duties. If the team is not able to guess the word, control of the mouse is turned over to the opposing team. The winner is the first team to land exactly on the final space This means that a team that is far behind still has a chance to catch up if their opponents run into bad luck with the dice. An interesting feature of the game is the option to redraw the graphic that was created for the last word. Another nice feature is the status display. When "(S) = STATUS" is visible at the bottom of the screen, choosing this option displays the number of the team that's winning, how many spaces ahead they are and the number of times each person has had control of the mouse. Documentation that includes a full explanation of game play as well as registration information is included. The text also includes suggestions regarding etiquette of play, which one may or may not decide to follow. I hope that this program proves to be as much fun for your group as it was for ours. And please support the hard-working shareware programmers by sending them your contribution.